Zipcar’s blockbuster IPO isn’t only good for the car sharing market — as well as Zipcar’s coffers, and Zipcar’s patient investors — but it’s also a nod to just how adding networks, radios, chips, software, and a well-designed website can lead to a more efficient use of resources. At Green:Net next week (April 21, register here), we’ll be exploring how adding these IT technologies to anything from the power grid, to data centers, to buildings, to lighting can lead to energy efficiency and a more sustainable consumption of increasingly-constrained resources. It’s not just shared cars that are getting the IT treatment. Our personal vehicles are getting more and more electronics, computing power and network connections. In a mid-range vehicle sold in the U.S., electronics make up 20-30 percent of the car’s cost, Freescale exec Steve Nelson told us last year (GigaOM Pro subscription required). Electric cars will have even more computing power and GM’s extended range electric car the Volt uses 10 million lines of software code, 100 electronic controllers, and each Volt on the road has its own IP address. Beyond cars, buildings are one of the most important areas that need help from IT. In an afternoon talk at Green:Net, Cisco’s (s CSCO) Marthin De Beer, SVP, Emerging Technologies and Consumer Business, will be giving the audience a glimpse into Cisco’s connected building technology, which will help building owners significantly curb energy consumption. Big Ideas startup BuildingIQ will also explain to the audience at Green:Net just how its software can reduce energy use in commercial buildings. Commercial and industrial buildings might be an easier sell for energy efficiency technology than the average consumer’s home. But that isn’t stopping some startups from building businesses around ways to convince consumers to change their behavior around energy consumption. OPower Co-founder Alex Laskey and Control4 CEO Will West will be discussing at Green:Net what is working and what isn’t for home energy management technology. Silver Spring Networks will also be hosting a panel on how smart energy choices will effect individuals, communities and cities. Don’t wait to register for Green:Net, it’s going to be a great day of conversation, debate and learning. Register here (and students contact me about our student rate, katie AT gigaom.com). 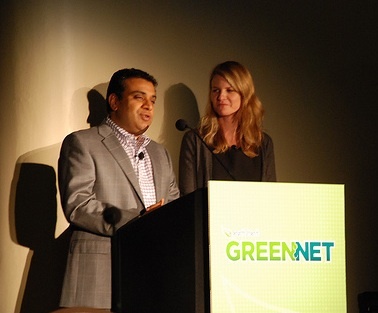 Image of Green:Net 2009, our first year! Thanks for this interesting post. Siemens is doing similar campaigns in the US at the moment: http://www.usa.siemens.com/sustainablecities/index.html The website also includes a link to the Green City index – which I found really helpful, especially for educational purposes!